Thanks to the Red Deer Roller Derby Association, volunteers, Officials and Fans! Contact the River City Steamrollers, Oil City's newest men's team!! Book it now and be ready to cheer, scream, and flinch as these girls skate hard, turn left, and bring their best strategies to knock each other into oblivion… or at least the laps of those sitting in Suicide Seating. *Please remember to bring cash to our Edmonton Locations ! SEASON PASSES AVAILABLE NOW! Click Here! If you would like to donate to our league use the paypal button below. Thank you ! The Oil City Derby Girls will be recruiting in the Fall of 2011. 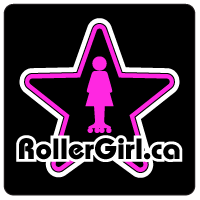 Oil City Derby Girls' mission is to provide a fun, professional and safe environment for women to develop superior skills in the sport of roller derby. We strive to promote self-discipline and personal improvement, while empowering women to embrace their athleticism and strengthen their team spirit. OCDG gives women the skills and confidence to succeed both on and off the track.